Pest birds are increasingly becoming a problem in urban areas, where large populations of certain species can cause serious problems such as the spread of disease, structural damage to buildings, the contamination of stored products and noise pollution. Although there are 11 species identified as pest birds in the United Kingdom, only the following three are a serious problem in urban areas. 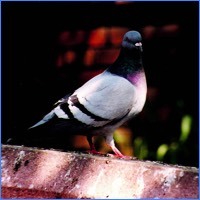 The most common urban pest bird in the world, the feral pigeon (columba livia) is originally descended from the domesticated rock dove but have reverted to their wild form. They live in close proximity to man, building their nests on both modern and old buildings and inside the lofts of houses and commercial premises. Feral Pigeons are scavengers, finding an easy source of food in town centers, where they are fed by the general public or by the scraps of food which are often found outside food premises. Numbers of feral pigeons are increasing due to a lack of natural predators, the constant supply of food and the fact that they can breed all year round. Gulls are probably the fastest growing population of pest birds in the UK. Their behaviour has altered over the past 20 years and they now prefer to build their nests on rooftops rather than cliff faces. 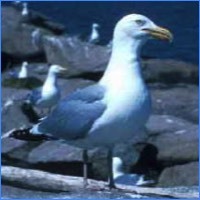 Gulls are scavengers and feed from scraps of food in town centres as well as sewerage outlets and domestic refuse tips. They are large and aggressive and have been known to attack people as well as domestic pets and other animals. There are a number of birds that are not defined as pests under the Wildlife and Countryside 1981 Act which can still cause the same problems associated with the build up of fouling and nesting materials. It is an offense to "kill or take [any of these birds], to take, damage or destroy their nests or to take or destroy their eggs." However, once these birds have left their nests it is possible to install physical proofing to prevent them from returning. Starlings and Sparrows, although smaller in size than the previous birds, are no less a problem due to their vast numbers. Up to 1 million Starlings can be found roosting in one place and whole populations of both Sparrows and Starlings can live in stored food premises. Produce stored in buildings infested with these birds can become heavily fouled - even bagged goods in these areas can become damaged. The noise associated with large numbers of these birds can also pose a serious problem. 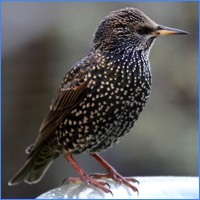 Starling droppings can also lead to the growth of several types of fungi including histoplasma and capsulatum which can lead to lethal diseases in humans. Starlings are also becoming an increasing problem on domestic properties and are especially common on large new housing developments where they enter a property through gaps in roof tiles and then build their nests in the soffits. Once the nest has been built, it cannot be removed due to their protected status. Because of the noise that young Starlings make, often very early in the morning, this can be a very distressing problem. With house martins amber listed due to their population decline, it is inappropriate to prevent them from nesting entirely. However, Bird Management Solutions can provide proofing solutions to prevent them from nesting in sensitive areas such as above windows and doors or on the front of buildings. We can also install special shelving under Martin nests to catch their droppings. 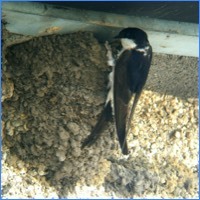 Our proofing methods for Martins are in accordance with the RSPB's guidelines.